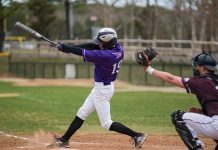 At 5:45 am Tuesday morning, cars pulled into the Martha’s Vineyard Regional High School (MVRHS) parking lot, and half-awake kids got out, lugging athletic bags and water bottles — some had field hockey sticks, others had football helmets. The start of school is less than a week away, but students who expect to participate in fall sports have been in preseason practice since Thursday, August 25. 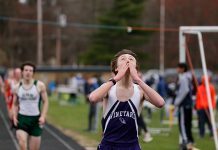 “I definitely don’t look forward to the early mornings, but I did it in high school; it’s a rite of passage,” mom Stacey Porterfield said as she dropped off her son Owen, a sophomore who runs cross-country. Some parents make the mornings easier by working out a carpool system, or simply drive up in their pajamas, ready to go back to sleep as soon as they get home. For the coaches, this is their first look at their team for the season. Field hockey head coach Lisa Knight takes the opportunity to survey her players and begin the building process. Team bonding is a big part of preseason. Coaches will pause practice for a teamwide game of rock, paper, scissors, or challenge another team to a water-gun fight. They also have to get the athletes in shape for upcoming scrimmages and games. 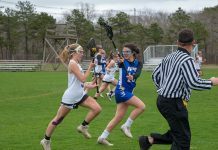 “It helps when people show up to hell week after training during the summer, but that doesn’t always happen,” assistant field hockey coach and goalie coach Beth O’Connor said. The athletes get to know the fields and trails that they will be running on all season, doing sprints or longer endurance runs around the perimeter. It’s important to get everyone in shape as quickly as possible; the first games, scrimmages, and meets are right around the corner. Sophia McCarron is a MVRHS senior and member of the field hockey team.